Looking for a new menu or just a menu redesign for your café, bar or restaurant? Your menu can say a lot about your restaurant, café or bar. Let us help you design a menu that will give your customers that great first impression of your restaurant’s best features, great food and drinks and unique style! 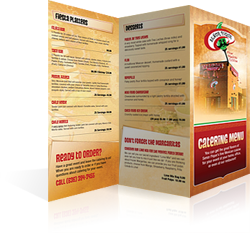 Our custom menu design services offer single or multiple page menus designed to address your unique needs, menu layouts and location requirements. We can create menus around your location, taking into account geographic, landmark and local styles to create just the right look that helps your patrons select their dishes!